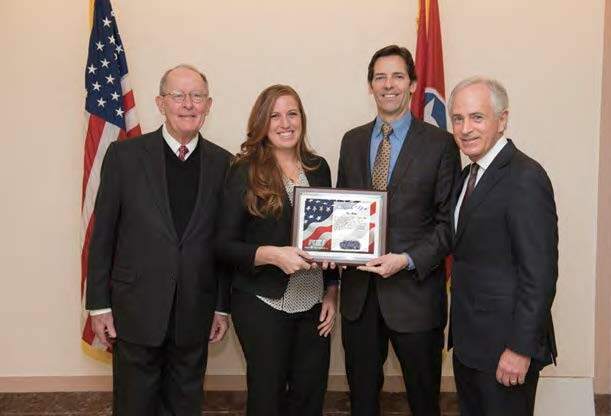 REI General Manager, Tom Jones, recently met with Tennessee Senators Lamar Alexander and Bob Corker in Washington DC, along with Stacie Oliver, Senior Professional Staff Member, Senate Committee on Foreign Relations, to discuss export control reform. The meeting also provided Jones an opportunity to express his appreciation for their help on behalf of REI. The OSCOR Blue Spectrum Analyzer was launched in 2010 for worldwide distribution. Due to the technological advances in the product, export regulators determined it needed to be restricted for export. Several years of negotiating and navigating export regulations resulted in the OSCOR Blue’s successful removal from export restriction in 2016, thanks in large part to the support of the senators, and Oliver’s personal involvement. The OSCOR Blue now has the same export control status as the OSCOR Green.